Community service is at the heart of the LeagueAires mission and is what inspires our members to make singing a part of their every Monday. 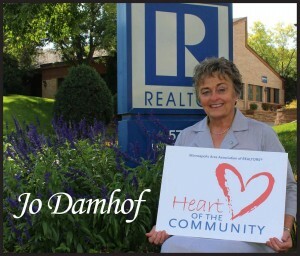 Jo Damhof, a LeagueAire since 1993, is also a realtor with Edina Realty. In 2014, Jo was singled out by the Minneapolis Area Association of REALTORS with the Heart of the Community Award for her ongoing investment to the community through LeagueAires. Sing on, Jo!